Roto Motors are manufactured by one of the leading model engine company from the Czech Republic. 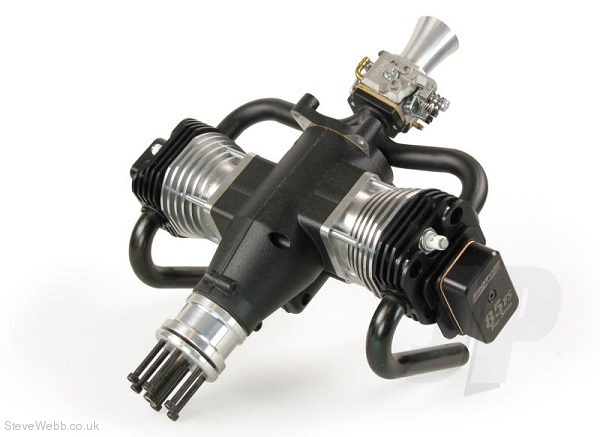 No expense has been spared with any of the materials and components used to produce this range of quality high performance petrol engines.Roto Motors use a Rotary Valve Induction system to aid easy starting and smooth consistent linier performance with a slow idle speed. One of the only petrol engine manufactures to use conventional model type engine mounting system on the 25, 35 and 35fs size engines. This allows easy installation into most aircraft. Fully shielded electronic ignition system insures no interference with your transmitter signal. Crank case - The engine case is rough cast Aluminium then CNC finished to the highest tolerances finished with a strong heatproof powder coating. Cylinder sleeve - Manufactured from one piece of dural with pressed insole from the mild-granular cast iron. It is then shaped and honed to the correct size. Piston - The Pistons are cast from high quality Silicon Alloy and machined to a high tolerance. Crankshaft - The Crankshaft is hade from one piece of high grade steel machined then hardened.All components are carefully cleaned and scanned to verify they comply with the strict tolerances Roto Motors demand. RPM 1200 - 6000 with propeller 25-27"